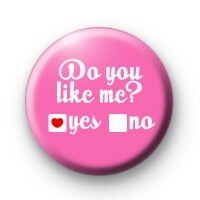 This pretty bright pink 1-inch button badge asks the question, Do You Like Me. With Yes & No, answer boxes. Of course, the YES box has a heart in. This is a sweet romantic badge and quite perfect for Valentines Day. Go on tell that special someone you like them, you never know where it could lead. Our handmade badges make lovely tokens of love and look cute pinned to the front of cards & used in your craft projects.